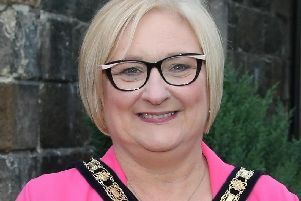 The former leader of the SDLP Margaret Ritchie has said that she is “positive” about the potential for a link-up between her party and Fianna Fail, after initially sounding a cautious note about the idea. Miss Ritchie, who led the party for 21 months during 2010/11, was speaking on the BBC political show The View. A week earlier she had appeared much cooler about the idea when interviewed by The News Letter. It has been suggested by an anonymous Fianna Fail source in the Irish Times that the ultimate aim is to absorb the SDLP wholesale into the much-larger Dublin-based party. And when asked about the idea of the name ‘SDLP’ vanishing from the political landscape after almost 50 years, Miss Richie (who is recovering after treatment from breast cancer) told the paper this “would be a severe matter of regret”. But on Thursday night’s edition of The View, she said: “I think this presents an opportunity; it’s not about a takeover. In 2010, she had declared no merger with Fianna Fail would happen “on my watch”. As to what has changed, she said Brexit came along, and Stormont collapsed. She added that “I think people are looking for a new type of politics that demands we do something that’s different, but above all delivers for the people”.